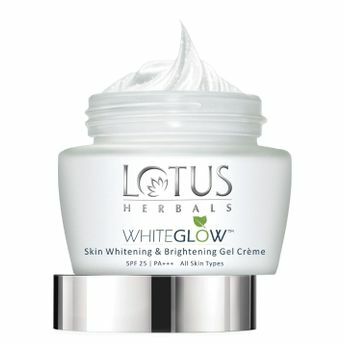 Lotus Herbals Whiteglow Skin Whitening & Brightening Gel Creme is a revolutionary fairness solution that incorporates the advantages of a gel and a Creme. It is an apt product with an amazing combination of gel and cream to help you fight the harmful sunrays and remain tan-free for a long period due to its SPF 25 PA+++ formulation. This unique base facilitates fast absorption, leaving you with youthful looking supple skin that radiates brightness. The Mulberry, Saxifrage and Grape extracts help make your skin brighter, override the harmful effects of skin darkening and lend a beautiful texture to the skin surface post application. Its milk enzymes act as natural fairness agents and lightens the skin tone with a visible difference. You can now effectively tackle the harmful effects of both UVA and UVB on applying this cream. Contains the goodness of Mulberry, Saxifrage and Grape extracts. Gel-based cream that absorbs quickly and gives oil-free look. Keeps you protected against the harsh UVA and UVB rays. Rejuvenates the skin from within and provides extra glow. SPF 25 PA+++ formulation works effectively as a skin lightening agent.